At 13:42 hours the crew contacted ATC requesting permission to start the engines and clearance for a VMC climb via Fuji-Rebel-Kushimoto. The aircraft left the ramp at 13:50. It was instructed to make "a right turn after take off", and departed Tokyo Airport at 13:58. After takeoff the aircraft flew over Gotemba City on a heading of approximately 298 deg at an altitude of approximately 4900 m and indicated airspeed of 320 to 370 knots. The aircraft, trailing white vapor, then suddenly lost altitude over the Takigahara area, and parts of the aircraft began to break away over Tsuchiyadai and Ichirimatsu. Finally over Tarobo at an altitude of approx. 2000 m, the forward fuselage broke away. The mid-aft fuselage together with the wing, making a slow flat spin to the right, crashed into a forest. The forward fuselage crashed into the forest approx. 300 m to the west of the above site and caught fire. BOAC's flight 911 had taken off in perfect weather twelve minutes before the disaster from Tokyo International and had climbed to 6,000 feet. The passengers were probably peering out the starboard windows for a glimpse of the mountain. Among them were 75 dealers and executives with their wives from Minneapolis' Thermo King Corp., on a 14-day company-paid tour of the Far East, a reward for outstanding sales. Suddenly witnesses on the ground saw the plane belch white, then black, smoke. To some it seemed to come apart in midair, pieces of wing and tail fluttering to earth like dry leaves. Presumed cause: either a mid-air explosion or disintegration as a result of turbulence from the very strong gusts of wind that prevailed around Mount Fuji that afternoon. Due to the clear weather, Dobson asked for an amendment to the scheduled flight plan, climbing visually via Mt. Fuji to allow his passengers a rare up-close view of the Japanese landmark. 911 left Tokyo at 1:58pm and began climbing southwest towards Mt. 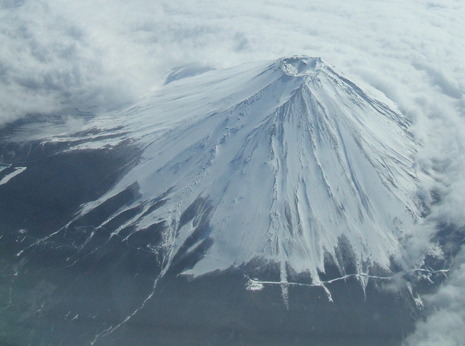 Fuji, reaching 17,000ft. Passing over Gotemba, the aircraft turned northwest and began a slow descent towards the 12,400ft mountain. Shortly afterwards, witnesses reported seeing the aircraft trailing white vapour. The aircraft was then seen to be shedding pieces and then a large puff of vapour came from the aircraft's tail. It pitched up and entered a flat spin, the tail assembly and engines seen to be missing and the starboard outer wing had failed. The forward fuselage then broke off and the aircraft continued in a flat spin until impacting the base of Mt. Fuji. All aboard 911 were killed. A Boeing 707 has crashed into Mount Fuji in Japan killing all 124 people on board. 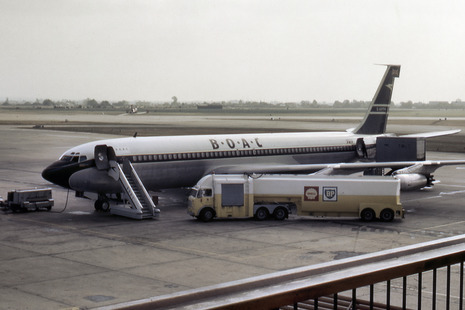 The BOAC (British Overseas Airways Corporation) plane plunged into the wooded slopes of the dormant volcano, 25 minutes after taking off from Tokyo International Airport. 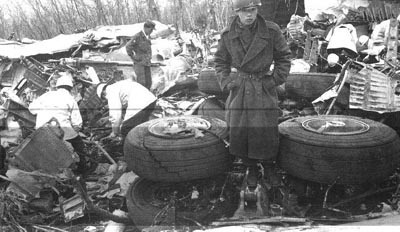 This was the third American-built aircraft to crash in the area in about a month. 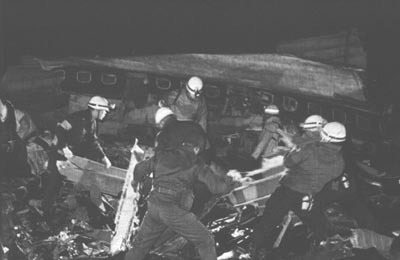 Early in February, a Japanese Boeing 727 crashed in Tokyo bay, with the loss of 133 lives. And less than 24 hours ago a DC-8 of Canadian Pacific Airlines crashed on landing at Tokyo killing all 64 people on board.